We’ve seen the soft-focus, pastel-washed pregnancy photos on Facebook. The faux-rustic “we just happen to sit on bales of hay and touch my belly a lot” angle is also increasingly popular. But Georgia mom-to-be Kristin Johnston wasn’t feeling those for her maternity photo shoot. She took her baby bump to Taco Bell. America gave this a big, chalupa-sauce-covered thumbs up, with Today.com and other outlets picking up the story. 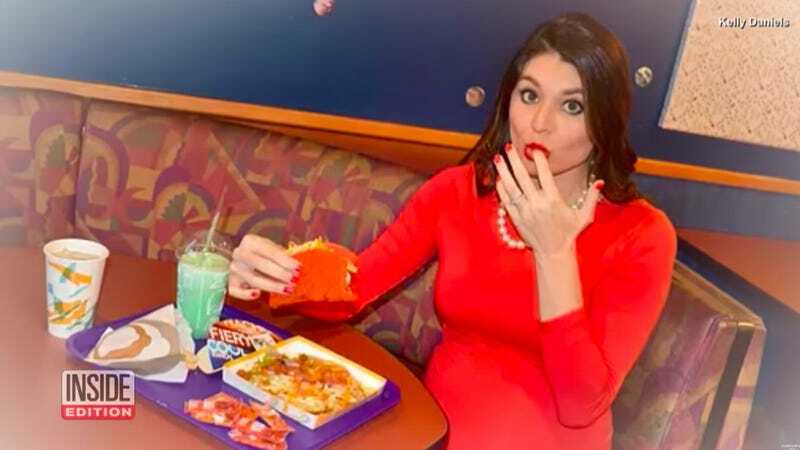 Though the only baby I’ve ever incubated at Taco Bell is a food baby, I have to begrudgingly admit that Johnston’s skill at coordinating her evening gown to what appears to be a Nacho Cheese Doritos Locos Tacos Supreme is impressive. “Maybe God-willing we will be blessed with a third and I can take one of those stunning mountaintop or beachside photos, but for now, I felt inspired to have my maternity shoot at one of my favorite places, a place that I can turn to anytime I get a craving or just don’t have the energy to cook dinner,” Johnston explains on her blog. No justification needed, Kristin; I’d like to add my completely worthless seal of approval to this maternity shoot. Anne Geddes, time to up your burrito game. Ask The Salty Waitress: Why do customers insist on stacking their plates?